Two macros that go very well together. Save by getting this COMBO! GDG Selection Saver: Save your selections for later reselection. Two modes, save and reselect based on the shapes static id, or name then find the shapes, re-selecting based on shape name. A great alternative to working with layers. Keep it simple! This is the X7 version. 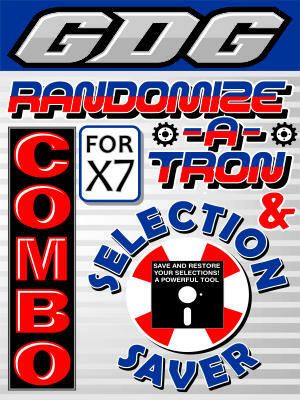 GDG Randomize-a-tron: The ultimate macro to randomize your shapes. Modes include random size, angle, skew, fill and outline color, random color blend between 2 colors, position, and outline width. This is the X7 version.